Admitted to the Ohio Bar; United States District Court, Northern District of Ohio; and United States District Court, Southern District of Ohio. Muskingum County Bar Association; Ohio State Bar Association; Ohio Association of Criminal Defense Lawyers. Enjoys spending time with family and friends, traveling, being outdoors, working in his yard, and sports. Kris Hill chose to become an attorney because he saw it as an effective way to help people in a time of need, becoming their voice in a complex legal system. Kris believes—truly believes—that everyone deserves a vigorous defense when they are facing a criminal allegation. He acts on behalf of people who have been accused or charged with felonies, misdemeanors, and OVIs, counseling them in the immediate aftermath and representing them throughout the entire process—in front of magistrates, prosecutors, judges, and juries. 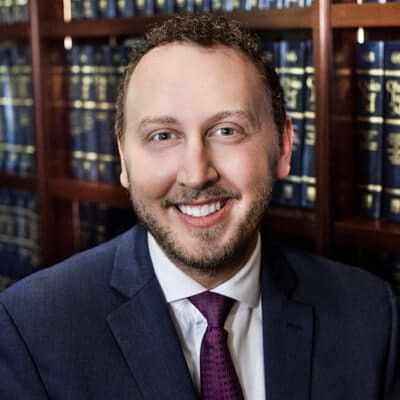 Kris uses his ability to evaluate all facts and identify the most critical issues to adequately inform, protect, and defend his clients in negotiations, motions, trials, and appeals. Kris says that the difference between early representation and not immediately calling counsel is significant. Whether you’ve been in trouble with law enforcement before, or not, there are critical missteps to avoid at all costs. Kris cares about his clients. He goes above and beyond to listen to their concerns and gets to know them as people, not merely a file on his desk. He knows that they are going through a difficult time, but also knows that he can guide them effectively through the legal decisions they need to make and the actions they need to take, including those that impact not only their lives but also the lives of their loved ones. In domestic relations and contested custody cases, his clients appreciate his ability to logically and effectively analyze their facts and to anticipate and communicate potential outcomes or consequences. He is also ready to “fight the good fight” when appropriate. While Kris enjoys analyzing the facets of a case and constructing a defense, he also has a talent for taking cases on appeal—challenging lower court decisions—or settling the score when rights are wronged. Kris tells of one case where, before his involvement, an individual had signed an immunity agreement in a murder case. In exchange for divulging to prosecutors and detectives all that this individual knew about the murder, which allowed them to build their case, they legally could not charge him with any crime. As it turned out, at the conclusion of the case, they charged the individual, despite the immunity agreement. Kris got the call and took on the case to defend his new client’s immunity rights.